It has been raining here nearly every day for over a week. It isn't just a light rain every now and then, it is torrential downpours and lightening storms that are causing flash floods in the area. 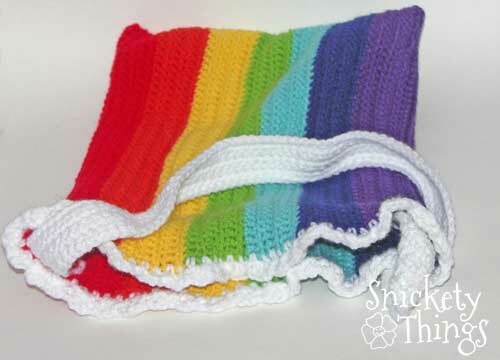 I worked this last week to make a crochet pattern that was a little more involved than all the short patterns I have posted. I'm still working through all of the yarn I bought to make Boo's rainbow scarf. I also used it to wrap her birthday presents and last week I posted a couple of rainbow headbands I made. 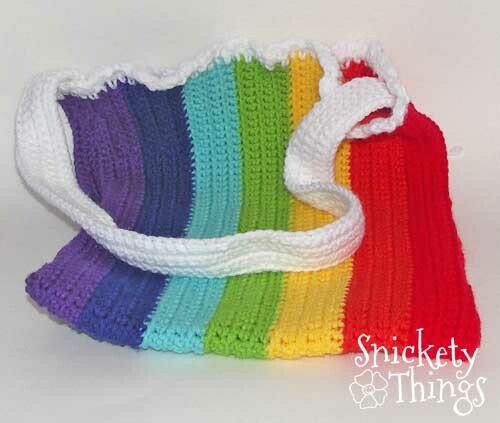 Today I have a rainbow tote bag. With all the rain, the rainbows are needed. I tried to do something different from the plain single crochet of the headbands, but I also wanted the weave to be tight so things wouldn't slip through. I settled on just slight modifying the single crochet to make a ridge that runs along the chains. I used an H crochet hook and I Love This Yarn in fire red (1), orange (2), yellow (3), limelight (4), turquoise (5), royal (6), grape (7) and white (8). You should have a rectangle that looks like this. 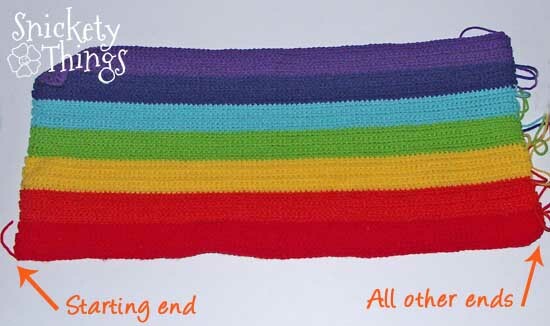 Notice that the starting yarn will be on one end of the rectangle and all of the other ends will be on the other end of the rectangle. At this stage, choose which side you want to show on the outside and mark it. Work the loose ends into the piece. Fold it in half so the outside is on the inside. Use the color (red or violet) that blends in to the edge. Using a tapestry needle, sew the edges together tightly so it will hold. After both sides are done, turn it right side out. The seams should be on the inside. Now to work the edging. This will cause the edge to pucker, but I wanted that to happen so it looked more like ruffles. Attach straps to the inside of the bag as shown in picture (the square and cross), sewing it on with the color that will show on the outside. 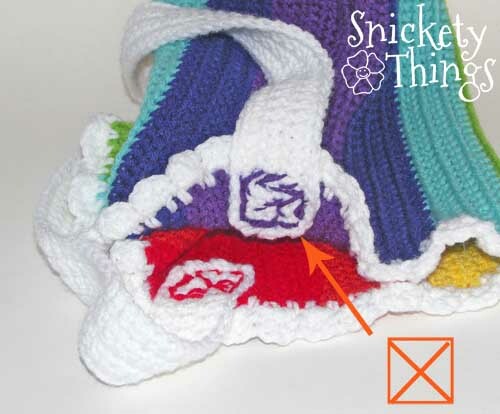 Just make sure each stitch goes over yarn on both sides to make a strong hold. This what the finished bag looks like. 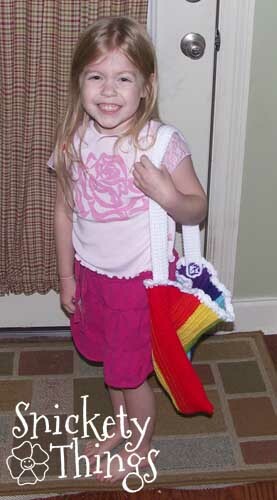 Here is Boo with her bag. She can't wait to use it. A simple fabric lining can be inserted if needed. I love this! it's so bright and cheerful, thanks for sharing. Thanks! My daughter loves rainbow, too. She keeps begging me to make her things. I'll run out of yarn soon. Very cute! It's nice to keep your hands busy while watching TV - then I don't feel guilty. Thanks, I usually do it while I watch tv or movies. Thanks, just grab a hook and give it a shot! Thanks! I'll stop by and check you out. So sweet and bright in the summer. Love the rainbow color. 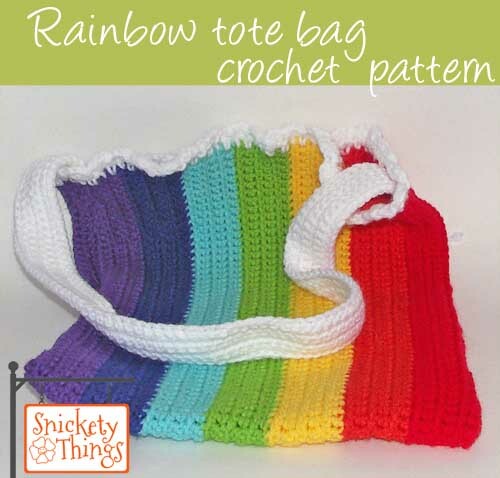 Thanks and welcome to Snickety Things! Thanks! I'd send it if I could. It isn't as bad now, but still raining about every three days. A book by its cover, Zombies!